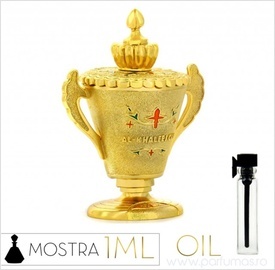 Parfum unisex oriental floral condimentat.Un parfum revigorant ce prezinta note citrice si mosc alb, note condimentate,sofran, migdale, lemn de santal si note florale. 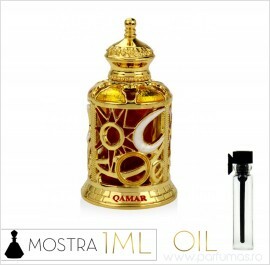 "Qamar" in traducere "luna", are un design atragator, sticla fiind ornata cu motive astrale: stele, luna si soare. It’s the kind of night that will make you silent and secretive. Stealing glances from behind a veil might not help after all, because the measured movements of your sashaying body give away hints of the restlessness within. Unknown desires blooming in your heart give off the fragrance of love…and passion.